Why consult encyclopedic references when you only need the essentials? 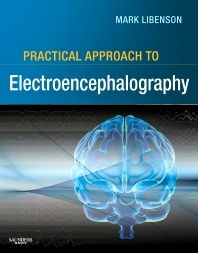 Practical Approach to Electroencephalography, by Mark H. Libenson, MD, equips you with just the right amount of guidance you need for obtaining optimal EEG results! It presents a thorough but readable guide to EEGs, explaining what to do, what not to do, what to look for, and how to interpret the results. It also goes beyond the technical aspects of performing EEGs by providing case studies of the neurologic disorders and conditions in which EEGs are used, making this an excellent learning tool. Abundant EEG examples throughout help you to recognize normal and abnormal EEGs in all situations. Presents enough detail and answers to questions and problems encountered by the beginner and the non-expert. Uses abundant EEG examples to help you recognize normal and abnormal EEGs in all situations. Provides expert pearls from Dr. Libenson that guide you in best practices in EEG testing. Features a user-friendly writing style from a single author that makes learning easy. Examines the performance of EEGs—along with the disorders for which they’re performed—for a resource that considers the patient and not just the technical aspects of EEGs. Includes discussions of various disease entities, like epilepsy, in which EEGs are used, as well as other special issues, to equip you to handle more cases.